Deliciously piquant through its blue veins. Every good cheese board should have blue-veined cheese. 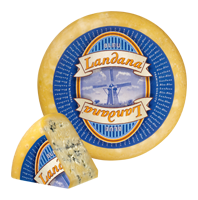 Landana BLUE is a pleasantly tangy Dutch blue-veined cheese, that is delicious with meats such as steak or chicken.